NEW DELHI: Indian cricket captain Virat Kohli obtained ‘zero’ points while reigning world champion weightlifter Saikhom Mirabai Chanu earned 44 points on way to being named for this year’s Rajiv Gandhi Khel Ratna by the 11-member selection panel. While Kohli’s performance sheet had no points because no criteria has been set for cricket, according to documents with TOI, there were at least six other Khel Ratna aspirants who totalled more points than Chanu. Wrestlers Bajrang Punia and Vinesh Phogat, who totalled 80 points each, scored the highest points based on their achievements, yet it was a show of hands that ultimately decided that the Indian Test captain and Mirabai (who edged out shuttler Kidambi Srikanth) would receive India’s highest sports award this year. Given the present system of calculating points, cricketers will always get zero points. They can hardly be blamed for an inefficient methodology. At the same time, it’s hard not to feel sympathy for other sportspersons who have toiled hard, often in obscurity, and notched up points through performances at global events. The answer, perhaps, lies in working out a way to award points for cricket as well. So, the cricket World Cup could perhaps be equated with the Olympics, the Asia Cup with the Asian Games and so on. This would clearly not be an ideal system as long as the BCCI remains adamant that cricket will not become an Olympic sport, but it would certainly be an improvement on the present methodology, which is completely subjective when it comes to cricketers. After a meeting with the sports minister on Thursday, Punia told TOI he would move court on Friday against his name being overlooked for the award despite having the highest performance points. The document, which breaks down the total points awarded based on achievements for 17 sportspersons shortlisted for the 2018 award, had para-athlete Deepa Malik behind Punia and Phogat with 78.4 points, followed by table tennis player Manika Batra (65), boxer Vikas Krishan (52) and archer Abhishek Verma (55.3). There’s no points system for cricket, which is not an Olympic sport. Often, cricketers are selected through consensus, leaving scope for controversy. A committee member confessed to TOI that there was a debate over how the performance of Kohli (whose name had been rejected in 2016 and 2017) should be judged since the points system has been framed keeping in mind performances in Olympic and international tournaments. “When Kohli’s name came up for discussion, it was decided to pick him through a show of hands in the absence of a points system for cricket,” a member said. “Eight out of the 11 members supported Kohli’s candidature and that’s how his name was recommended,” he added. “In the case of Mirabai and Srikanth, the same process was followed. Seven members raised their hands for Mirabai and six in favour of Srikanth. So, Mirabai became the second recommendation. There was a further debate on Srikanth’s inclusion and an internal voting also took place. But, opinion remained divided on his name, and only Kohli and Mirabai’s names were recommended. Bajrang and Vinesh’s names too came up for discussion, but they weren’t considered for the award,” the member added. 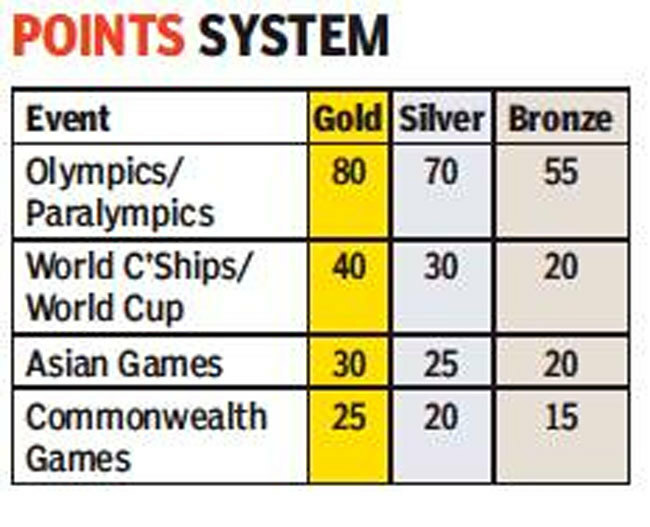 Interestingly, the committee can award discretionary points (up to 20) to a sportsperson over and above the points given for achievements in Olympics, world championships, Asian and Commonwealth Games. Out of the 17 applicants, the committee shortlisted 11 and awarded them points – Chanu (19), Kohli (18.5), Srikanth (18), Vinesh (13), Rohan Bopanna (12), Bajrang Punia (12), Neeraj Chopra (15), Deepa Malik (12), Vikas Krishan (14), Manika Batra (13) and para-wrestler Virender Singh (12). It still left Mirabai with 63 (44+19) points, Punia with 92 (80+12), Phogat at 93 (80+13), Malik at 90.4 (78.4+12), Batra at 78 (65+13) and Vikas at 66 (52+14) points. On Thursday, Punia, the Gold Coast Commonwealth Games and Jakarta Asian Games gold medallist, told TOI that he would move court on Friday after being snubbed for the award. Punia’s contention was simple: The committee awarded him the highest score, but he was still ignored for the country’s highest sporting award. “I want to ask them (committee members) a simple question: ‘What’s the use of having a points system in place when you don’t adhere to it? '” he asked. “If the members want to ignore my credentials despite it being amply visible that Vinesh and I have accumulated the maximum points, then what option do I have other than moving court?” Bajrang said. “I have immense respect for Kohli and Mirabai. They are two champion sportspersons, but if I look at my credentials and that of Mirabai, there is no comparison. You gave her the award, give it to me as well, it’s simple,” he added. Bajrang later met sports minister Rajyavardhan Singh Rathore to plead his case. “I only got assurances from the minister but I won’t wait until next year,” he told TOI. This year’s Khel Ratna and Arjuna committee was headed by a retired Delhi high court judge, Justice Indermeet Kaul Kochhar, and had former sportspersons Ashwini Nachappa, Kamlesh Mehta, Samresh Jung and Vimal Kumar as members, among others. Marking for Punia’s achievements was done based on his silver medal at 2014 Glasgow CWG (20 points), silver in 2014 Incheon Asiad (25 points), gold in Gold Coast CWG (25 points) and gold in Jakarta Asiad (30 points), taking his total ‘score obtained’ to 100 points. The ‘converted score’ (final points) awarded by the committee came up to 80 points. In Mirabai’s case, three of her performances were considered for the recommendation – silver in Glasgow CWG (20 points), gold at 2017 Las Vegas Worlds which is held every year (10 points) and Gold Coast CWG gold (25 points), totalling 55 points. The committee’s converted score was 44 points. Vinesh also had 100 points and her ‘converted score’ came to 80 points. Her Glasgow gold (25), Incheon bronze (20), Gold Coast CWG gold (25) and Jakarta Asiad gold (30) were taken into consideration.